FAWKNER has retained favouritism for Saturday's $3 million Cox Plate (2040m) at Moonee Valley after drawing perfectly in barrier four. 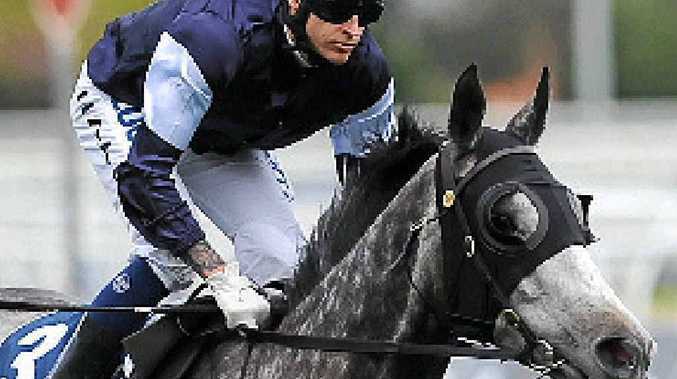 A winner of the Group One Caulfield Stakes (2000m) at his last start, the seven-year-old (pictured) is likely to settle in fourth or fifth place and was rated a $4 chance by Ladbrokes. English galloper Adelaide was given no favours in gate 13, but retained her position on the second line of betting at $6.50 with Sydneysider Sacred Falls (barrier nine). Likely leader The Cleaner ($15) drew the extreme outside (gate 14) and will have to use up plenty of petrol to get across to the fence. Happy Trails (gate two), Royal Descent (three) and Criterion (six) all fared well in the draw and look to have winning chances. A trio of three-year-olds - Almalad, Sweynesse and Wandjina - all gained a start and will try to emulate Seamus Award, which won last year at the same age.